According to the group, Brazil has one of the largest shares of adults without secondary education. Schools are overcrowded, teacher salaries and low and school buildings are often crumbling. Rio De Janeiro: President Jair Bolsonaro is taking his anti-leftist ideological war to Brazil’s classrooms and universities, causing angst among teachers and education officials who say the government wants to fight an enemy that doesn’t exist. For the government, the ideological battle begins with the removal of Freire’s legacy in schools, which Bolsonaro and other conservatives say turns students into “political militants.” Freire, who died in 1997, was one of the founders of critical pedagogy. Conservatives contend Freire’s method encourages students to challenge traditional values such as family and the church. A socialist, Freire was briefly imprisoned during the 1964-1985 military dictatorship that Bolsonaro has repeatedly praised. On the campaign trail, Bolsonaro said he wanted to “enter the Education Ministry with a flamethrower to remove Paulo Freire.” Bolsonaro and his education minster appear to be looking for inspiration in philosophers like Olavo de Carvalho, a Brazilian who lives in the U.S. and is known for his anti-globalism and anti-socialist views. “The government does not have to educate anyone; it is the society that has to educate itself,” de Carvalho said last year during a talk about education on his YouTube channel. He added that proposals “based on the idea that the federal government is the great educator I am going to fight to the death.” After Bolsonaro took office Jan. 1, the Education Ministry dismantled its diversity department and published a new set of guidelines for textbook publishers that eliminated references to topics such as violence against women and sexism. Velez instead defended what he called traditional values, such as family, church, school and the nation, which he said were threatened by a “crazy globalist wave.” Bolsonaro has said he would review the content of Brazil’s national high school exam to rid it of any questions on gender or LGBT movements. He made the announcement in a YouTube video after seeing a question from last year’s exam on a “secret dialect used by gays and transvestites,” called Pajuba. The military is also sometimes called in to co-run public schools and bring back order. Last year, 39.5 million students attended a public school, while private institutions, which can cost several thousand dollars a month, served 9 million. Opponents say the selective admission process of military schools would end up being discriminatory in impoverished areas. In general, critics say the administration is focused on the wrong things. The government “complains about indoctrination at school,” Costin said. More than 5.800 schools had no water supply in 2017, nearly 5.000 had no electricity and 8.400 had no sewage, according to government figures. 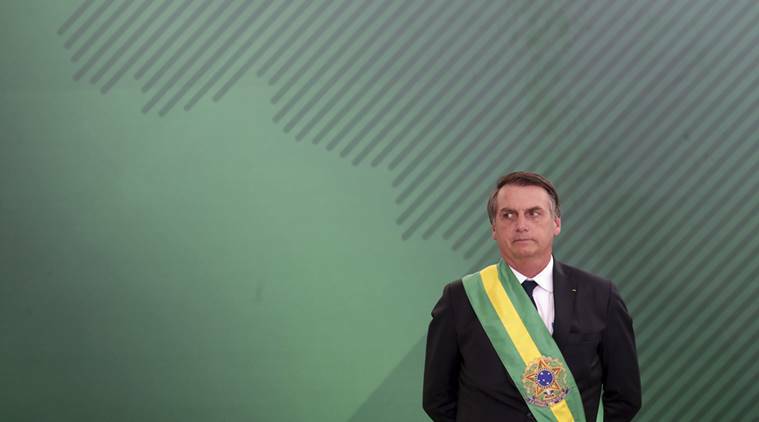 Many Brazilians don’t appear convinced by Bolsonaro’s plans.